Sign Up to Attend a Workshop! Join wildlife experts for four upcoming free Feral Swine Workshop and Trapping Demonstrations. 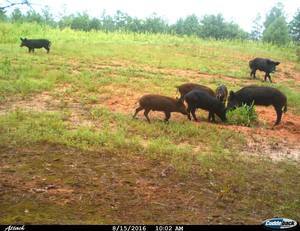 Topics include wild pig biology, regulations and laws, effective control techniques and more. Q&A follows presentations. Speakers include representatives from GA Wildlife Resources Division, University of Georgia, Ga Dept of Agriculture, GA Association of Conservation Districts, and USDA Wildlife Services. Lunch is included. Note: you will need to log in to your Customer Account HERE . If you don't have a customer account, click on "enroll now." Once you are signed in, click on the "Events/Volunteering" tab at the top of the page and search by date for the event you want to find. Click on the event, then click on "Register to Participate in This Event" and follow further instructions. Our emails will keep you up-to-date about important news. We promise we won't overwhelm you with emails; but if you wish, you can unsubscribe here.